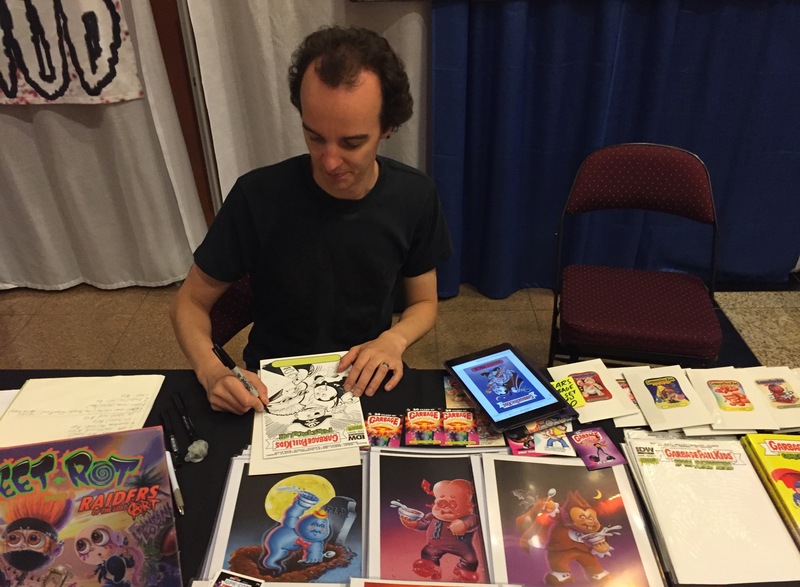 Current Garbage Pail Kids artist Joe Simko is a busy man. Not only does he do final card paintings for GPK and Wacky Packages, he has his own trading company, Wax-eye, and he was Co-Director of the recently completed 30 Years of Garbage documentary. I sat down with Joe at the first ever GPK-Con in Las Vegas. We talked about the 30 of Years documentary, his current GPK work, and other projects he has worked on. Joe Simko – It’s been great, the energy and the actual reception we’ve been getting has been very enthusiastic. We’re really pleased how it turned out. When we had the premier in New York City in July, there was a really nice packed crowd that was just very welcoming. I think they were waiting for this to finally be done, and so was I. It was great to finally put that out there and get that excitement, get that feedback back. GPKNews – You got to work on this project closely with not only another GPK artist, Jeff Zapata, but also your wife, June Gonzales. How was that experience? JS – Actually, it was good to have a group of people that I could trust. They were just so laid back enough to let everyone do their parts, but have the energy enough to know what they do really well. Jeff was really important to getting the original creators who made Garbage Pail Kids; Art Spegelman, John Pound, John Pound doesn’t do interviews you know, but as a favor for Jeff you know, ok. Jeff had such an important role in that, it was such a mega deal. When I explored and got other people, not just June, but I got Chud behind me sitting here doing the music. June explored the whole area of knowing this film needed some graphics, some artwork behind it. It couldn’t just be a straight documentary with a bunch of talking heads, which it was, but it needed art in it because it was about art. So she incorporated ideas with graphics, and the notebook. Showing it’s a school atmosphere with the Trapper Keepers and so it really worked well. Working at home and living with my wife, June, is a great way to have a Director/Editor relationship too. If I get an idea I can say let’s do it!, oh no it doesn’t work, ok fine we can move on to something else. We could be very quick in testing things out. JS -That’s a good analysis of it, yeah. It was relief, satisfaction, excitement, just total euphoria in a way. It’s very exciting, like you said, we’ve been working on it for almost 2 ½ years with people leaving and people joining the project throughout the whole behind the scenes making of it. The team that we put together really was the best team in the end. The results are shown in the film. We needed to have the premier in New York City. Jeff is from New York, I’m from New York, June is from New York, and Topps is in New York. We were able to bring in some of the original creators; Mark Newgarden came out, James Warhola one of the original artists, and we even had some Topps brand managers come out and approve of the film believe it or not, or just put their stamp on it saying they liked it. GPKNews – In the movie you talk about collecting GPKs when you were a kid. What childhood memories do you have of GPK? JS -Gosh I think this going to sound like a lot of similar stories from kids finding them at school or on the school bus. Not really getting it or understanding what they were, but I felt like I needed to know what they were, I needed to have it. Even if I didn’t understand what it was. I needed to have this for some reason. One thing that really forged my memory when I think back about it now is that I made friends with these things. There are ways kids can communicate today with other kids online socially that way, but back then without social media a kid walking up to another kid can be awkward. You have a kid have these Garbage Pail Kid cards, I got some too, I need what you have, so lets trade. I met kids at school, and kids at camp that I became life long friends with. GPKNews – I imagine work is finished with the art for the next GPK set, Trashy TV? Is it full steam ahead on art for the first 2017 set, Adam-Geddon now? JS -I’ve done about 6 or 7, maybe 8 paintings for the Adam-Geddon set so far. So its full speed into that one. GPKNews – How many paintings did you do for the upcoming Trashy TV set? JS -I painted 32 but got approved 41 or 42 so other artists will paint the others. That’s almost a full set for back in the day. GPKNews – Do you know how many total GPK paintings you are up to now? JS -I don’t know exactly, its over 200. That’s just published Topps GPK cards. I’ve done random GPK stuff for Topps that was never published in that format. 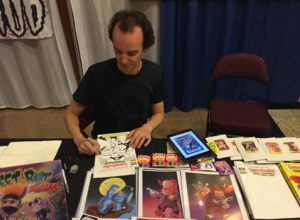 GPKNews – How many of these comic/toy/art conventions do you do a year? JS -Probably two a year; the Allentown, PA trading card show, and the New York Comic Con. Once and a while I’ll do a horror convention. It’s a nice mix of different genres, although its all kind of the same in some ways. GPKNews – This is the first GPK-Con, what are your thoughts of the show so far? How has the GPK fan turnout been for the show? JS -I’m loving it, I think it’s successful. I’ve personally had success at my table. The first night was great. This is the place to be if you’re a Garbage Pail Kids fan. 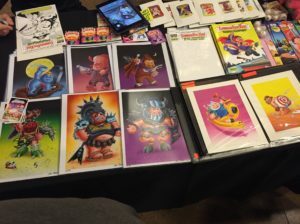 Where else are you going to get pretty much all the current artists, you got Tom Bunk here, you have vendors selling stuff at tables, and events happening throughout the whole weekend related to Garbage Pail Kids. Its going good. GPKNews – At the show you are selling not only the 30 Years DVD but, you have your own trading card company, Wax-Eye. You’ve released two Cereal Killers sets and the Stupid Heroes set. You are very busy! Any other projects in the pipeline for Wax-eye or another company besides GPK? JS -You know the documentary was like the big project that was taking up every hour, and now that it’s done my break is just doing Garbage Pail Kids and Wacky Packages for Topps right now. There’s like one or two freelance jobs for a personal custom commission, but no big major projects, I might be doing a poster here and there for a band but nothing heavy duty. 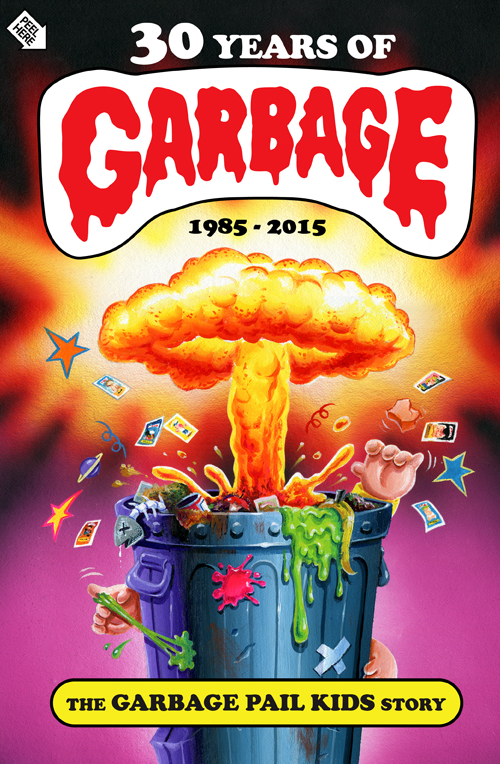 GPKNews – Finally, do you have an all time favorite Garbage Pail Kid? How about the favorite one that you have drawn? JS -I always say from the original series you go with the namesake, so I like Joe Blow. I feel like he’s a character that can be almost as iconic as Adam Bomb, because its representative of the Topps Bazooka Joe bubble gum they put out. For my own, I like the Nosferatu one I did. It only was released in the Bukimi Kun reprint set, it never made it to a formal GPK set. I have a skateboard I painted of the Nosferatu Dracula in a coffin in that same position. I just copied that directly into a Garbage Pail kid. I like making them really iconic. I want them to be very symmetrical, something that could be on a wrapper. GPKNews – Thanks Joe for the interview!